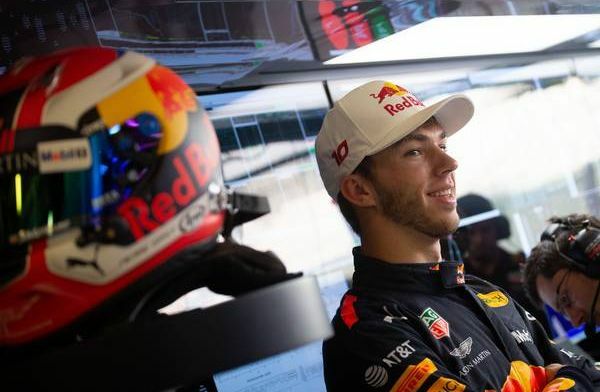 Red Bull Racing driver Pierre Gasly insisted it was better to let his team-mate Max Verstappen fight with the Ferraris in the Chinese Grand Prix. Gasly recorded his best position as a Red Bull driver, with the Frenchman finishing in P6 at the Shanghai International Circuit. The former Toro Rosso man also snatched the extra point from Sebastian Vettel, right at the death of the race. "I'm glad I have the fastest racing lap," Gasly said to Ziggo Sport. "We saw that I could do a free pit stop and so we decided to go for it. It felt good." About the possibility of figthing with Verstappen in the race, Gasly played down that possibility: "We rode side-by-side, but I knew we were not racing the same race. There was no point in taking many risks. "It was better for the team to let Max fight the Ferraris. So I tried to stay behind him, save tyres and improve the feeling with the car." After a disappointing two races up until now, it's taken a while for Gasly to get used to his new RB15 - slowly but surely - it appears the French driver is gettng there with the car. "We do everything step-by-step," Gasly added. "We still have to take many steps, but the good thing is that we know exactly where I can improve. I will also focus on that in the coming races."